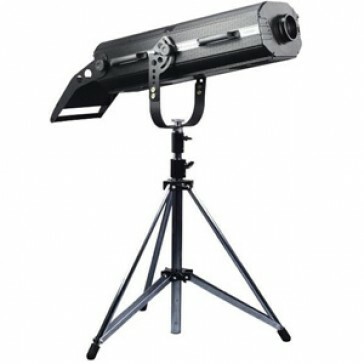 The iFollow 1200 is an easy to operate stage spot light. The iFollow provides a versatile stage follow spot light which is easy to operate. Includes a rugged case for safe and secure storage and transport. Stand included. Follow Spot with integrated controller. Includes 8 dichroic colours (plus White), effects wheel which creates 27 colour effects when combined with the colour wheel, automatic focus via a dedicated DMX controller and a high efficiency optical system. Motorized iris controllable from control panel. with the temperature filter of 3200K-5600K (plus open).